In 2003, SBEP launched P.I.E.R., an innovative education program aimed at educating and inspiring area students. The P.I.E.R. Program is offered to public, private, and home schools in Sarasota and Manatee counties. Nearly 38,000 students have participated since 2003. With P.I.E.R., the SBEP aims to educate students about coastal ecology and increase environmental literacy and stewardship in young people. Studies show that environmental education increases positive environmental behaviors and civic engagement - the two hallmarks of Bay stewards. P.I.E.R. field trips are conducted by certified naturalist educators with Around the Bend Nature Tours. During a dip-netting field trip, students will explore a local estuarine environment by wading into the grass flats at low tide. They will discover that an estuary is a special place that is found where freshwater mixes with saltwater. They will also learn about watersheds and identify and classify the animals that live in the estuary using a simple dichotomous key. The adjoining mangrove forest will be investigated to identify plants and animals there. With these activities, students will discover how humans interact with and are dependent on the natural world. Not only will students increase their knowledge, they will also develop a better appreciation of the natural world and will in turn be more inclined to protect it. Visit Around the Bend Nature Tours to request this activity for your classroom. Suitable for grades 3 and up with modifications for more advanced classes. Middle or high School classes can substitute water quality monitoring for any of the above activities. Visit Around the Bend Nature Tours to request this field trip for your classroom. Students will understand that crabs are wildlife and wildlife comes in a variety of forms – small to large. Students will understand that this place is home to wildlife, including crabs. Students will learn about crab anatomy and animal adaptations. 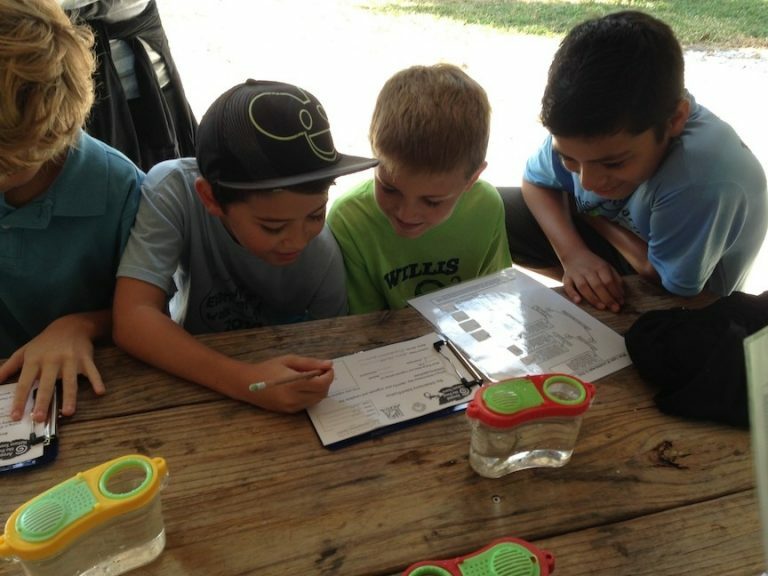 Students will learn what an estuary is, understand the importance of an estuary, and observe the unique plants and animals found in and around an estuary as they walk through the trails and shorelines of the site. This trip is only available during the warmer months of September, October, early November, late March, April, or May, as crabs hide in the mud during cooler months. Visit local natural and developed areas to learn about stormwater management and low-impact development in an urban setting. Sarasota County – North Water Tower Park: Classes will tour the site, learn about and perform invasive exotic plant removal, and participate in water quality monitoring. Includes a specialist visit to your classroom. Manatee County – 5th Street in Palmetto: Classes will tour the award-winning low-impact development demonstration site and view firsthand the concepts in practice, including pervious concrete, tree box filters, bioswales (rain gardens) and permeable pavers. After the tour, the bus proceeds to Emerson Point to allow students to practice water quality monitoring and view the natural systems that are being modeled in the urban landscape of 5th Street. Water Quality Testing – using LaMotte Kits, students will measure water temperature, pH, dissolved oxygen, phosphate, nitrate, and salinity.